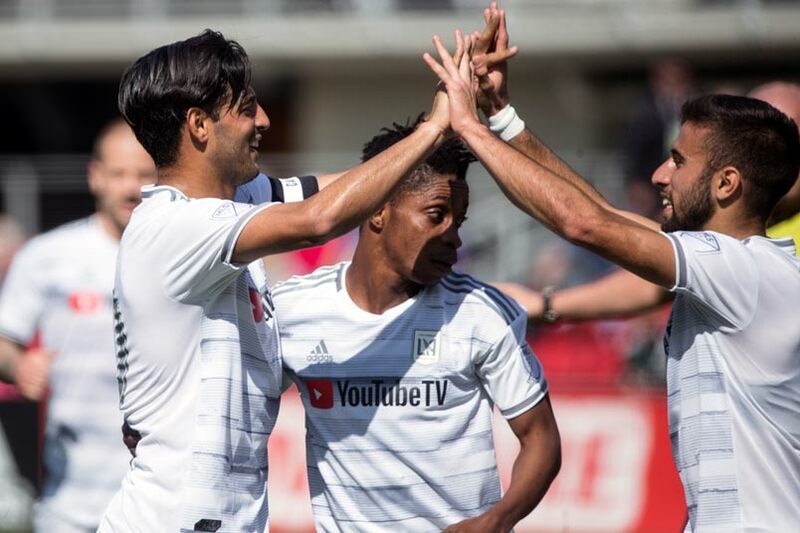 By Luis Bueno – RIVERSIDE, CA (Apr 10, 2019) US Soccer Players - For the start of its second season of existence, Los Angeles FC has taken a different approach. Instead of a sophomore slump, LAFC has propelled itself to even further heights. LAFC is flying so high and looking so good doing so that the team may not come back down to the ground any time soon. The class of the league through the first six weeks, LAFC hit the ground running in 2019 and is only moving forward. LAFC is on pace to shatter some records that have stood for a long time. Even though the season is young, LAFC appears to be the real deal and looks poised to keep up its high-scoring ways throughout the year. Major League Soccer could be witnessing the best offense in its history taking shape. It may seem like a stretch to tag LAFC with that after such a brief period of time, but they're shattering records in the early going. These are milestones from the league's early days, considered safe before LAFC's rewriting of the record books. Through six games, LAFC has scored 19 goals. The previous record was 18, set by the 1998 LA Galaxy side, which boasted the league’s greatest attack ever. That Galaxy team scored 85 goals in 32 games, 11 goals better than its closest competitor. DC United’s 1998 team and Toronto FC’s 2017 team each scored 74 goals respectively while San Jose netted 72 in 2012. Only seven teams ever have cracked the 70 goal plateau, with Atlanta and DC United the only teams accomplishing that feat twice. For its part, LAFC has the ninth-best offense all-time, scoring 68 goals in its inaugural campaign. That it did so as a first-year side was remarkable given the struggles expansion teams have faced in recent years. LAFC also was a bit in Atlanta’s shadow. Atlanta scored 70 goals in its first year and contended for the Supporters’ Shield throughout last season. Carlos Vela leads the league with seven goals and was Player of the Month for March. Vela had six goals and three assists in five games in March, including a hat-trick in a 5-0 win at San Jose to close out the month. He's already the frontrunner to walk away with the league’s Most Valuable Player award. Not only is Vela scoring goals at a high rate, his highlight reel is already eye-opening. Vela might be the MVP frontrunner at this point but LAFC is far from being a one-man show. Diego Rossi has six goals after his hat-trick in the 4-0 demolition of DC United on the weekend. Like Vela, Rossi is in his second year in MLS. Unlike Vela, Rossi is closer to 20 than 30. At just 21, Rossi is not as seasoned as Vela. Still, Rossi had a solid showing in his first year in the league, scoring 12 goals and adding nine assists in 2018. Rossi is promising to be the 2 in LAFC’s 1-2 punch throughout the season. For any attack to be truly prolific though it needs to have three prongs. The Galaxy’s 1998 side had three players hit double digits in goals with Cobi Jones leading the way with 19, Welton adding 17, and Mauricio Cienfuegos contributing 13. LAFC already did that as well. Vela scored 14 a year ago with Rossi scoring 12 and Adame Diomande scoring 12 in 18 games. What set the Galaxy’s 1998 team apart though was the number of players who had double-digit assist totals. Six players on that team had 10 assists or more. Another six had at least two assists. 16 players overall registered assists. LAFC has 10 players already with at least one assist and half of them have at least two. Vela leads the team with four assists while Latif Blessing and Diomande have three. Lee Nguyen meanwhile has no assists, but he has not played since March 10 due to injury. Once he rejoins the team fully fit the club will have yet another weapon to throw at its opponents. One thing that may slow LAFC down is the possible loss of Vela due to Mexican national team duty. At least that was the thinking before the season. However, incoming Mexico coach Tata Martino left Vela off Mexico’s roster for a pair of friendly matches last month and may not use him for the Gold Cup at all. The tournament runs from June 15 through July 7. LAFC plays just three games during that span, so a possible loss to Gold Cup duty would be minimal. Even if Vela is out, LAFC is deep at forward. Diomande has scored twice in six games this season but has started just three of them. Christian Ramirez is another option at forward. Ramirez scored 14 goals in 2017, his first season in MLS. He has one goal in five games this season and is a capable striker. LAFC’s goals are capturing everyone’s attention, but the team is more concerned about winning than statistics. If this team can make winning look good and set some records in the process, it will only help cement their place in MLS lore.